There are days when we love to fool our image by doing the opposite of our habits, you know those days when we die for eating hamburgers when usually we cook vegetables, days when we prefer watching a trashy TV show instead of reading a book, days when we deliberately choose couch potatoe-ing instead of gym. Laziness? Most likely, but also the freedom to try and to make mistakes. And thus, my fake and bling python pants were born. The fabric is a coated stretch. I didn’t use any pattern, I just copied a pair of jeans that I liked the fit and, in two cuts and three stitches (well, dozens of stitches in fact), my python came to life. I added two front and back plated pockets. Well I can tell you that this coated fabric, although synthetic and difficult to sew (like leather, the seams marks remain forever) is much more comfortable than I thought. I have not washed it yet, do you think it supports washing machine? The easiest way to wear these pants is to pair them with big wool sweaters. 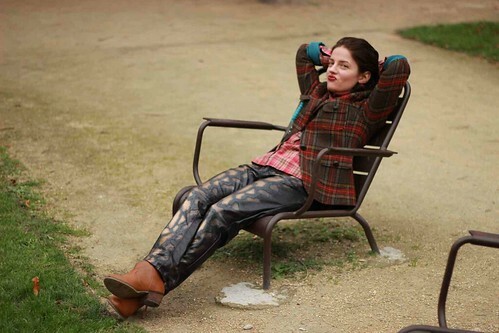 However, the day of the photo session, I took a riskier option with my tartan shirt and jacket. These classic and humourless pieces were struggling to get out of my closet and so they come out to the light with a piece of fake snake. This entry was posted in Projects and tagged fake, pants, prints. 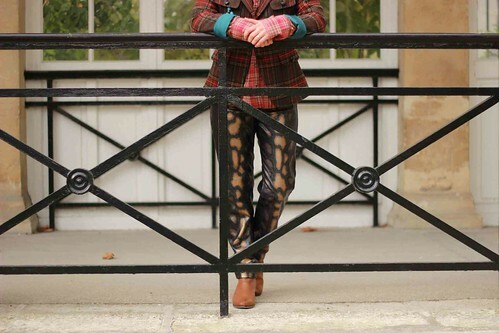 I like the unexpected mix of the python with the tartan & plaid. 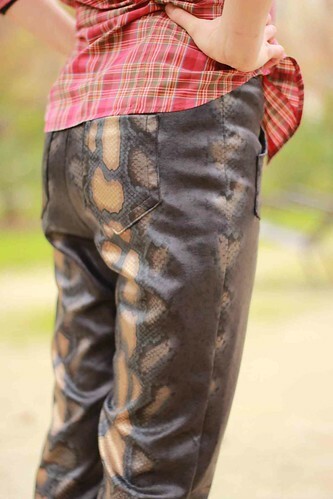 From afar, the python pants look as though they’re open lace down the middle of each leg. Pretty cool. You are right, the illusion is perfect in the photos…i didn’t notice until you did.